So, the following weekend after having the BMW i3, it was time to give the Nissan Leaf a go. Now this is the elder statesman of the 3 cars I’m testing, having been released in the US and Japan in 2010 and in the UK in 2011, it’s fair to say my expectations for this car were pretty low. I’ve never driven one and I’ve never been a fan of how it looks, but I’ll try to be objective and fair… I think. It’s clear upon initial arrival that the Leaf is still an important car for Nissan, evident from the car in showroom and the sheer number of Leafs (Leaves?) in the car park. Now while they don’t have a dedicated specialist like BMW, the sales person I got was very pleasant and knowledgeable about the car, we had a good chat about what I was after and I let him know about the other cars I was also testing. Nissan offer up to a 4 day demo of the car, the Sales person efficiently booked me on, using an iPad no less, all very modern! The Leaf was booked to be picked up the weekend after the i3 test drive. While BMW have quite a breadth of cars in their range, I’m not sure it’s quite as evident as the Nissan show room. At one end of the space was a new 2017 model, fire breathing, GTR, a supercar in anyone’s eyes and at the other end, in fact right at the front door, was the Nissan Leaf, worlds apart you might say. Good impression of Nissan so far. On the day of collection, I was intrigued more than enthused about how the drive was going to go. When I arrived everything was handled efficiently again. The sales person remembered me by name and after signing the obligatory forms, I was taken out to the car. An interesting thing at this point, he advised me that the approach he usually takes is not to explain too much about the car, because if a customer is taking an ICE car for a run, he doesn’t explain how to drive it … so he treats the Leaf in the same fashion, shows how to start, where indicators and handbrake is, which oddly is foot operated by the way, and lets customers work the rest out themselves. 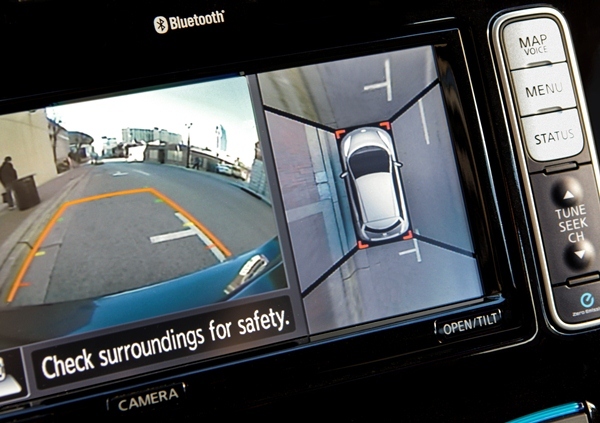 A refreshing approach I thought, as it treats them as just another car, good job Nissan! Another good point, although not surprising really, was the demo Leaf was a 30kWh Tekna version, rather than the 24kWh original one, this means the range is extended and should be somewhere around the 100 mile range, rather than the 80 miles of the original, the Tekna spec is range topping, with lots of gizmos and options, including the impressive 360 surround camera view when reversing, be interesting to see how this goes! Initial impressions, foot operated handbrake (technically footbrake?) feels odd, I’ve only driven a car with one once before, while visiting Florida, so it was still quite alien. Apart from that, seating position is higher than ‘normal’ car, but not massively so, certainly lower than the i3, but everything else felt very familiar and comfortable, hmmm performance is surprisingly spritely, nowhere near the i3, but very nippy all the same. The default drive mode doesn’t have brake regen, so coasting is quite simple and a tap back on the gearknob drops it into full regen mode, which is not quite as strong as the GTE or i3. The leaf is definitely a bigger car than the GTE or i3, easily seats 5 persons on the very comfortable seats, leather on the Tekna spec, the boot is massive for this sector of car another good point. Lots of positives stacking up here…. am I beginning to like this car? As mentioned previously, we should always take all opportunities to show anyone, who is interested, around electric cars, explaining the pros and cons and letting them experience the car. Some people will get the green aspect, some the potential for cost reductions, but I hope most just will see it as, hey it’s just like a really quiet smooth normal car and maybe even consider one in the future. Initial impressions from my colleagues are not positive however, while the were not impressed with the look of the i3, they positively disliked the Leaf, in particular the ‘squashed frog’ front as they put it. Why do electric car manufacturers have to make Electric cars…. different looking, odd looking or just plain ugly. Only Tesla and to a lesser extent Renault with the Zoe make an EV that is a nice looking car….. why? You’d almost think the traditional manufacturers don’t want to sell loads of these…… hmmm? I took my colleagues for a run, easily fitting 5 adults, including me into the Leaf, most of them prefer this interior to the i3, which surprised me, the usual quiet comments apart, nothing much said from my passengers, they seemed impressed with the drive and interior, but the ‘look’ of the car seemed to outweigh that, leaving, on balance, a slightly negative view of the Leaf. Driving the car, initial impression for my wife was, the handbrake was stupid….. just stupid and she hates it, maybe just a touch over dramatic! But the driving was nice, comfortable and felt safe and easy to drive in. My girls were similar to my wife, as passengers they quite liked the interior, the heated seats front and rear, standard in the Tekna, particularly being liked on this chilly evening. Genuinely positive impression from the ladies, my view was similar I have to admit, its a very comfortable car to drive, my son on the other hand was firmly in the ‘no chance’ camp, probably not surprising for a young man. 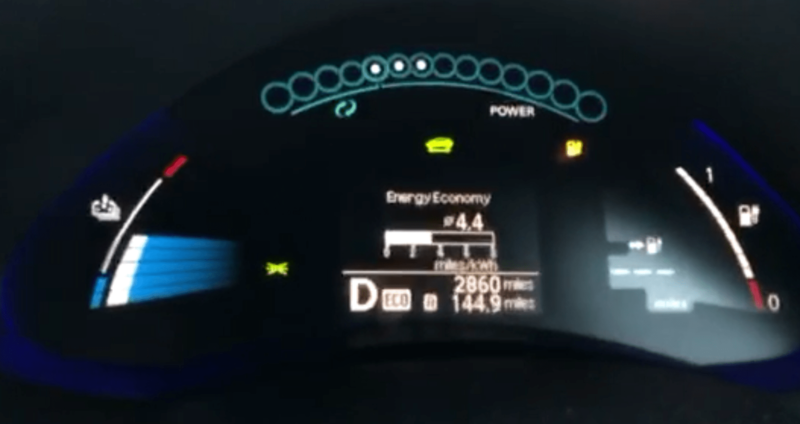 OK, so the Leaf has been out since 2010 and at the time the requirement for Rapid charging meant you had to include a ChaDeMo port and the Leaf duly has this, but in order to charge normally from a 13amp socket or a home charge point the Leaf also uses a Type 1 (J1772) socket in addition to the ChaDeMo socket, this means a quite large opening is required and for me its a little unwieldy as a result. Its also confusing for those that haven’t investigated electric vehicles before, the sooner a standard socket is agreed the better for electric cars, but I can’t see this happening anytime soon, with ChaDeMo in Japan and US being most popular, CCS being adopted as the European standard and Tesla Superchargers in the mix of Rapid chargers, its confusing for all but the most informed users. Then we have the AC Sockets, Type 1 being the older one, supporting only single phase up to 6.6kW and the more recent type-2 socket, supporting up to 70 kW, although more common are 7.3kW on single phase 32 amp, 11kW or 22kW on three phase amp and 43 kW on three-phase 63 amp as in the Renault Zoe. Confused? Me too and this was my mistake with the Leaf. My home charger is tethered, meaning it has a permanent cable with a type 2 plug for my GTE, this is great and very convenient, except the Leaf has a type 1 socket. this meant I had to use the 13amp plug version of the charger, which was going to be painfully slow to charge, around 12 hours from flat. However lucky for me there is a Rapid charger within a couple of miles, so I mainly used this on the test drive. If I choose a leaf I may have to change my charge point to an un-tethered one so I can use on both cars, this would be unfortunate. My family didn’t get half of this when I explained either, which could be another problem going forward. So to range, the Leaf displayed 108miles when I picked it up, it wasn’t fully charged either, but the run to work and then home appeared to take more out of the battery than I expected, but this is probably not very representative of normal driving, as I had 5 people in the car doing multiple runs. I’ll wait and see when we do a trip the next day, similar to the Newcastle run. The previous night I nipped down to the local Rapid charger and charged to 85% in just 35 minutes as by then it was quite low on range, then drove home and parked up for the night charging the remaining 15% on the 13 amp plug lead. In the morning the car indicated 111 miles. 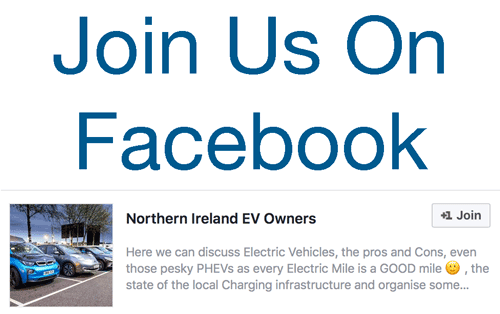 My intention was to drive down the Ards peninsula, through Millisle to Portaferry, catch the Strangford ferry and take a run up through Lisburn to home, around 90 miles, so should be fine, we would be in range of some chargers if required so no concerns. So like the i3 trip I intended to drive the entirely journey without concern for the battery and no intention of charging…. confidence is a wonderful thing…..
At this stage with roughly half of the journey complete, we decided to take a detour out via Coney island and onto Tyrella beach for some site seeing, I played Van Morrison’s Coney island song as we drove the route, she’d never heard the song before, but as the sun shone over the hills, it was a perfect accompaniment, this over confidence in remaining range was maybe a mistake though. While the sun was shining the temperature was still cold, this and the hilly nature of this route seemed to really start to bite the battery and at Comber, indicating almost 90miles travelled, my wife asked me to take over. The car range was indicating 16 miles left and the range was flashing, I was starting to get concerned as it was around 15 miles to home. I thought about using a public charger, but couldn’t find my card, I must have left my E-CarsNI card at home and therefore couldn’t use public charger….a little bit of panic started, I would have to make it home! This was concern was clearly not the fault of the car, rather my over confidence and relative lack of experience of driving a Battery only car, so we drove on, in Eco mode, Brake regen enabled when possible and sensible, we didn’t limp home by any stretch of imagination, but drove as economically as possible. Then with about 3 miles to go and I believe 8miles indicated on the range, the dashboard changed to 3 dashes…. this concerned me more, but so close to home I drove on, happy I could make it to a charger and get my son to bring the card if there was an or if Turtle mode was engaged. In turtle mode, the Leaf won’t accelerate past a safe speed (32 mph/51 km/h) and will go for around a mile or so, after which…well … it’ll stop. But Turtle mode was not needed, I pulled into the driveway at my house as the Battery low sign was displayed on the dash, I forgot to actually check the percentage battery left! But I drove up to garage and plugged in to the 13amp power supply to charge. I don’t know how close to Turtle mode I got, but I believe there is a ‘Very low’ battery warning before Turtle mode is engaged, so perhaps I was safe enough. The rest of the weekend we drove some more, finishing up with around 280 miles travelled over the entire weekend, including a 36 mile blast at 70mph+ from Maghera to home, as we needed to get home for a certain time. it was noted this kind of driving does impact negatively on range seriously, but no more than an ICE car I’d expect. 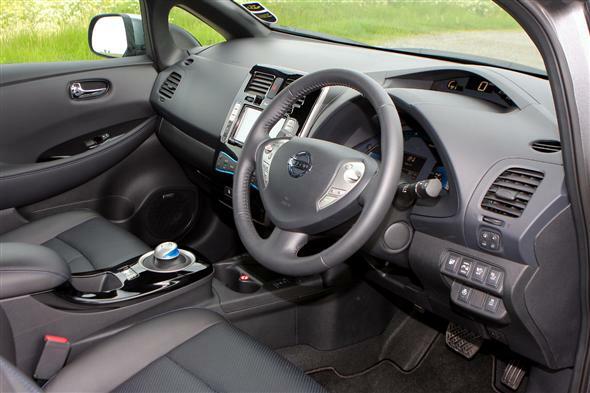 I have to say, the car performed admirably and we enjoyed driving the Leaf, it really really has surprised me how good a car it is, My wife really likes it and could tolerate the outside. The looks and the more complicated charging options would be the only negatives, The interior, to me, after driving all weekend is a nice, if a touch boring, place to be, it’s well put together and well spec’d, but for me is behind the BMW in terms of feel, fit and finish. As for economy, the old boy has clearly looked after itself as we averaged 4.1mi/kWh over the weekend peaking at 4.9mi/kWh at times! This is going to get interesting and a much tougher decision than I anticipated just ahead of the Zoe drive. We will discuss all the pros and cons in the conclusion part across all cars jointly to allow fair comparison. 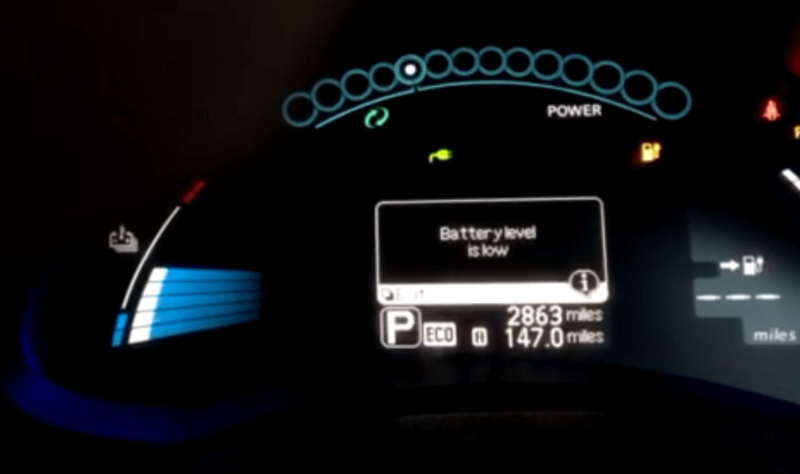 8 Comments on "EV Bake off – Part 3 – Nissan Leaf"
Excellent review! Now how about a part 6 with the b class electric drive? Well funny you should mention that…. I’d be happy to let you have it for a test drive, there would be no point in me reviewing it as I’m biased and it would be. I’ve to see how it compares to all the other ev’s you have tested up to now. We will be in touch ! I have been driving a Leaf for 2 1/2 years and when we change in Janurary, we will seriously consider the Zoe 40kw and the 30kw Leaf. I loath driving non electric cars now almost as much as I hate filling them up with fuel at a filling station! If you had a Leaf for more than a few days you would soon get used to the for operated parking break. Over time it makes complete sense. At the point when EV’s can do 200 miles per charge and don’t cost £60k to do so, we will all be driving them. We might even look back and wonder why we bothered with inefficient fossil fuel burners in the first place? I know I did! Good luck with the Zoe test, when it lands. Yeah agreed, I do believe we are a path to EV from ICE, probably sooner than I would have thought a few of years ago. Each generational update is knocking down the ‘reasons’ for not changing, I wonder what things will be like in 10 years ……. Indeed! Just think of there we’d be if the pioneering work of Nikola Tesla had not fallen into obscurity following his death in 1943? 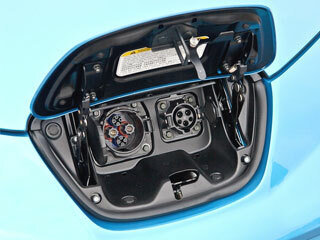 Exciting times ahead for electric cars…..